Spring arrives in a burst of color and creativity at art shows and festivals around the state. Celebrate the opening of trout season: Trout caught in any Watauga County body of water can be judged in this competition. Broyhill Lake will be an especially good stop for kids — some fish will be tagged with prizes. This unique new museum will exhibit hundreds of items related to the house cat. The collection was created over the past 30 years, and will be both educational and entertaining. Donations help support Catman2, a cats-only shelter. Learn more: (828) 293-7754 or catman2.org. Performing at The Schaefer Center for the Performing Arts, this band features artists from 11 different countries along the Nile River in an effort to create music that inspires, educates, and brings awareness to the Nile River Basin and the importance of sustainability. Learn more: (800) 841-2787 or schaefercenter.org. Esteemed neurologist Frances Jensen will speak about adolescent brain development and risk-taking behaviors. Her talk will help parents develop strategies to start conversations about substance abuse with their teens, and will help teens understand their own development. Learn more: (828) 254-6345 or ashevilleschool.org. Six new art exhibitions will be showcased at the Turchin Center for the Visual Arts; meet the artists and enjoy refreshments. Learn more: (828) 262-3017 or tcva.org. In its seventh year, this market will feature the work of Potters of Madison County members and a guest list that includes some of the best potters in the Southeast. Meet the artists and browse their work to add to your own collection. Learn more: (828) 775-6075 or pottersofmadisoncounty.com. Benefiting the Upper Yadkin Valley Habitat for Humanity, this family- and walker-friendly 5K/10K will take participants through the streets and trails of Elkin. Learn more: (336) 526-2277 or uyvhabitat.org. This concert at Drendel Auditorium will feature The Tesla Quartet, the second-place winner at the 2016 Banff International String Quartet Competition. More than 70 different wines will be available to try, along with samples from participating restaurants, as you walk down the street and explore the shops in historic downtown. The Easter Bunny makes his appearance on the Biltmore Estate’s front lawn on Easter Sunday; three egg hunts throughout the day will provide ample opportunity to fill up baskets. Head downtown and enjoy wine, craft beers, shopping, food, music, and the blooms of the season at this four-day festival, which celebrates all of the tastes of spring. Learn more: (828) 295-7851 or savorblowingrock.com. This annual festival attracts huge crowds to downtown. Enjoy food, local vendors, entertainment, carnival rides, kids’ activities, a 5K, and a band. Learn more: (704) 435-3451 or cherryvillechamber.com. Celebrate spring’s arrival in the mountains at this free street festival downtown, which will feature three different stages for live music. Learn more: (828) 631-4587 or greeningupthemountains.com. APR 27-30 This annual music festival has grown in size, popularity, and acclaim since its debut in 1988. This year it will feature artists such as The Avett Brothers, the Zac Brown Band, James Taylor, and many more. Learn more: (800) 343-7857 or merlefest.org. Walk between locations at this free event downtown, which will showcase more than 75 artists at 30-plus galleries. Enjoy live music, food, and drinks; meet the artists; and browse through shops. The Hendersonville Symphony will perform masterpieces like Tchaikovsky’s Symphony No. 4. In addition, the symphony’s 2017 Young Artist Competition winner will perform a classic concerto. Learn more: (828) 697-5884 or hendersonvillesymphony.org. Balloon artists, face painting, amusement rides, a carousel, and more will provide entertainment for all ages at this annual festival in Shelby City Park. A variety of vendors will be on hand to satisfy food cravings. Learn more: (704) 484-6811 or cityofshelby.com. This art exhibition showcases the artist’s wit and humor in lively paintings that bring a pop of color to the gallery’s walls. Learn more: (336) 679-2941 or yadkinarts.org. In this Tony Award-winning musical comedy, Eliza Doolittle, a rough-around-the-edges girl, seizes the opportunity to reinvent herself, breaking barriers and changing the lives of everyone she meets along the way. This two-day festival will celebrate the role of fire in the creation of art, with workshops, live music, an iron pour, large sculpture firing, and a glassblowing demonstrations. Celebrate spring’s arrival by strolling through the garden and enjoying more than 24,000 tulips in bloom. Learn more: (336) 996-7888 or cienerbotanicalgarden.org. Get tips from experienced gardeners at this annual plant sale. Browse a wide variety of flowers, plants, and herbs that are known to do well in the Sandhills, and take part in a garden “white elephant” sale. Jim Quick and Coastline, The Embers, Band of Oz, and Hip Pocket perform at this beach music celebration. Bring your dancing shoes and enjoy food and drink vendors when it’s time to rest your feet. This 69th annual tour will explore some of the beautiful homes and gardens of its club members. The proceeds from the event fund scholarships for local horticultural students and preservation projects. Learn more: (910) 690-1440 or southernpinesgardenclub.com. Play early 20th-century games, watch woodworking, and take part in a cake walk and a maypole dance. Kids can make toys and stationery; adults can tour the historic Reid House and see a variety of antique cars. Learn more: (704) 708-4996 or matthewsheritagemuseum.org. Carrboro closes Weaver Street and invites people to reclaim the public space. Take part in activities such as rock climbing, yoga in the streets, and more. Learn more: (919) 918-7392 or facebook.com/carrboroopenstreets. The orchestra will play Purcell’s suite for strings, “The Gordian Knot Untied,” Bernstein’s Symphonic Dances from West Side Story, and Grieg’s Piano Concerto, among other works. Learn more: (919) 660-3333 or music.duke.edu/events. Peruse a wide selection of native azaleas, wildflowers, perennials, trees, shrubs, carnivorous plants, and more for your garden and yard. This concert features the South Carolina Broadcasters, a foot-stomping bluegrass band that will captivate listeners with extraordinary harmonies and instrumentals. This fund-raiser hosted by the Moore County Historical Association will help maintain and renovate the historic Bryant House and McLendon Cabin, the oldest home on its original foundation in Moore County. There will be live music, historical reenactors, and more. Learn more: (910) 692-2051 or moorehistory.com. This celebration will feature eco-friendly products and services, live demos, T-shirt and tree seedling giveaways, and arts and crafts created with reused materials. Hundreds of plants will be up for sale at the North Carolina Unit of the Herb Society of America’s annual herb sale, which also features special vendors, gardening tips, and more. Learn more: (336) 643-6736 or ncherbsociety.org. A dozen actors play more than 100 characters in this whimsical, grown-up prequel to Peter Pan, which is sure to amuse both children and adults. In the city that’s home to the R.J. Reynolds Tobacco Company, old cigarette vending machines have found new, innovative life as Art-o-mats — dispensers of tiny art. 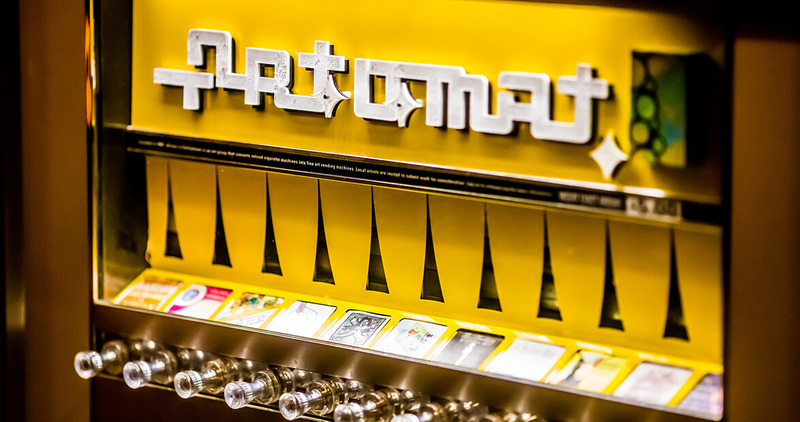 The Art-o-mat has become a fixture at art venues, breweries, and coffee shops across the U.S., but it was Winston-Salem artist Clark Whittington who first created one in 1997. For their 20th anniversary, the machines, miniature artwork, and more will be on display at a retrospective exhibit at the Southeastern Center for Contemporary Art from April 20 through August 26. Learn more: (336) 725-1904 or secca.org. Bluegrass and acoustic group Balsam Range will perform their unique blend of jazz, country, gospel, swing, and old-time music. Founded in Haywood County, the group won both Entertainer of the Year and Vocal Group of the Year at the 2014 International Bluegrass Music Awards. This established string quartet has been lauded for their visionary performances, and has been the ensemble in residence at the New England Conservatory for 22 years. They’ll perform works by Bach and Beethoven at Christ United Methodist Church. Through preshow request cards, the audience determines the set list at this tribute concert. Billy McGuigan and Tara Vaughan are backed by the All Star Band, and perform music from the ’50s through the ’80s. Learn more: (919) 553-1737 or claytoncenter.com. At this spring festival, people in period costumes will take to the streets. On the annual homes and gardens tour, artists will be stationed at each of the historic homes. Learn more: (919) 333-4899 or johnstoncountync.org. See how crops are grown, how baby barn animals are raised, how fresh ingredients are made into tasty food and beer, and much more when the Carolina Farm Stewardship Association and Weaver Street Market host this 22nd annual self-guided tour of more than 35 scenic and sustainable farms in Orange, Chatham, Alamance, and Person counties. Learn more: (919) 542-2402 or carolinafarmstewards.org. A variety of different media is featured at this exhibit, including paintings by Ellie Reinhold, sculptures by Jason Smith, and pottery by Evelyn Ward. In this inspiring play, customers take notice when a Chinese immigrant’s shoe repair shop curiously doesn’t open one morning, and they eventually realize what the shop owner has meant to their Harlem community. Explore the history behind North Carolina’s military prison during the Civil War. A banquet, lectures, displays, memorial services, and a tour of the prison site are included at this 20th annual symposium. Art demonstrations and art making are combined with unlimited tastings of North Carolina’s best craft beer (while supplies last) at this annual event. Proceeds will benefit the Sawtooth School for Visual Art’s scholarship fund. Learn more: (336) 723-7395 or sawtooth.org. This annual festival celebrates the arts and crafts community. It will feature more than 170 artists, entertainment on four stages, and tasty food. Shop handmade crafts, dance to live music by The Embers, and snack on state fair-worthy food, such as funnel cakes, grilled turkey legs, and barbecue, at this annual spring festival, which celebrates the yellow blooms. Learn more: (919) 242-4573 or fremontdaffodilfestival.weebly.com. Browse herb and plant vendors and local artisans at this 25th annual fair, which is the longest-running and largest plant sale in the area. There will also be food, kids’ activities, and hikes in the Abbey Nature Preserve. This spring nature program invites children and adults to learn about the distinguishing characteristics of different species of snakes and spiders. Live examples will be on hand. Learn more: (910) 347-5332 or onlyinonslow.com. This annual festival features street fairs, arts and crafts and food vendors, live entertainment, parades, and more. Learn more: (910) 794-4650 or ncazaleafestival.org. Get a behind-the-scenes look at homes and gardens in the historic district, while learning about original architecture, renovations, and furnishings during this tour, celebrating its 50th anniversary this year. At Sylvan Heights Bird Park, kids will enjoy bird-centered stories, crafts, educational activities, and an Easter egg hunt in the park. Tenore is a classic tenor pop trio known for its members’ powerful vocals and charisma. Unlike other tenor groups, Tenore regularly invites audiences to sing along with them, creating a unique concert experience. An internationally acclaimed, advanced community handbell choir, The Raleigh Ringers have been performing unique interpretations of popular music since their founding in 1990. More than 150 crafters, plus local food vendors, will be on hand at this spring celebration, which will have kids’ activities, a raffle, entertainment, and a 5K on the Southport waterfront. Five public buildings, all more than 100 years old, will be featured on this tour, which also includes 18 private homes and plantations. Head downtown for the 250th birthday celebration of the Historic Chowan County Courthouse to enjoy carriage rides, history reenactments, boat tours, food, and live music. Learn more: (252) 482-7800 or edentonpilgrimage.org. This annual boat show is one of the largest and most successful in-water shows between Annapolis, Maryland, and Savannah, Georgia. Check out the wooden boat exhibit, which features classic sailboats, rowboats, canoes, and more. Learn more: (252) 249-0228 or orientalboatshow.com. This street festival will have tiny houses to tour, plus the opportunity to meet state and regional builders. It will also feature a vendor marketplace and food trucks. About a dozen beautiful homes and gardens, as well as Bath’s historic houses, will be open for tours during this annual event hosted by the Historic Bath Garden Club. The 19th annual Lighthouse Run will feature a half marathon, 10K, 5K, and a one-mile fun run. The course will run along the scenic North Carolina coast. Learn more: (910) 457-5787 or oakislandlighthouserun.com. Each year the Howell Woods Environmental Learning Center celebrates environmental education with live music, hayrides, recreational activities, and local food vendors. The day ends with a campfire, s’mores, and astrology activities. Learn more: (919) 938-0115 or visitfouroaks.org. Powerful and compelling performers, the Jasper String Quartet won Chamber Music America’s prestigious Cleveland Quartet Award in 2012, and is the professional quartet in residence at Temple University’s Center for Gifted Young Musicians. Get in touch with your inner foodie and wine connoisseur at this annual five-day festival, which features tastings, dinners, seminars, auctions, and more. Learn more: (252) 515-0708 or beaufortwineandfood.org. Klezmer is the traditional Jewish music of Eastern Europe. At a concert performance by this six-member band, you’ll hear and celebrate the waltzes, horas, freilakhs, shers, and tzardisas associated with this music tradition. Learn more: (252) 638-7351 or cravennc.edu. Put on a happy face and go see this classic musical comedy, which centers on the Elvis-like teen idol Conrad Birdie and his final publicity stunt before he enters the Army. This is one of the largest offshore fishing tournaments on the East Coast. All proceeds benefit the UNC Children’s Hospital and childhood cancer research. Learn more: (336) 340-2121 or reelinforresearch.org. A variety of local restaurants will showcase their culinary talents by presenting specially created dishes featuring duck, which attendees can sample with a wine pairing. Learn more: (252) 216-8908 or duckandwine.com. Run through historic neighborhoods and alongside the Ocracoke Harbor. Take your pick from a 5K, 10K, half marathon, or family fun run. Learn more: (252) 207-1305 or ocracokeisland5krun.org.